"My relationship with Wilt goes back 42 years, because way back when, in 1957, I was recruited by Wilt and some of the players at Kansas University, and was to be a starting guard on that team my sophomore year, playing with Wilt. And, of course, when I attended KU, he announced that he was going to quit and sign with the Globetrotters which he did, and I decided to transfer schools and go back to my home state and play at the University of Illinois. It's funny how lives cross paths. That was my first experience with Wilt. Connie Hawkins and the Phoenix Suns battled the Los Angeles Lakers to seven games during the 1970 NBA Playoffs, before falling to the Wilt Chamberlain-led team. "I do remember in Allen Field House in the Freshman-Varsity game, I intercepted a pass between two guards and I was the only guy going the other direction. I was considered fairly quick back in those days, but believe it or not, Wilt caught me and pinned the ball against the board, which I'll always remember because it looked like a monster over the top of you. Wilt knew weight training and was into track and doing things that basketball people weren't doing back in the '50s, so he was way ahead of his time. "A little bit later, lo and behold, I'm coaching against Wilt in the playoffs, when the Suns, in their second season (1969-70), played the Lakers. Wilt came back from an injury and helped lead the Lakers to a victory over us. So he got me twice. 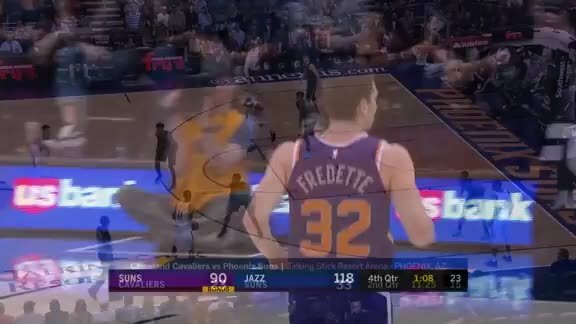 "Kiddingly, I say the third time hurt more than the first two, when he got his 25,000th point in a game against the Suns here in Phoenix and I had to give him a basketball. That's the one that really hurt. "But Wilt without question, was one of the great all-time players in the history of the game. The only question that comes up is was he the best or the second best or third best. Again, his numbers speak for themselves, a man who once averaged 50 points a game one season, he got 100 points in a single game, won a couple of championships, was in the playoffs like 11 or 12 of the 14 years he played -- a phenomenal record, a phenomenal athlete. I guess the biggest thing that anyone could say is that it's a big, big loss from a big man. He made a big impact on college basketball, he changed the rules of college basketball, and certainly made a great impact on the NBA. "Wilt was such a dominant big man and played so much over the rim, that everyone concentrated their efforts on stopping Wilt Chamberlain. He became one of the great passing centers of all time. In fact, in one season, I believe he had 700 assists if I'm not mistaken. As he aged as a player, he changed his game. He developed different shots as he went through his career. The "little dipper dunk," if you recall, when he would flip the ball over the rim. He had the hook shot, the sky hook. But more than anything, I would say, he could do just about anything he needed to do except shoot free throws. He always had a problem with free throws and that bothered him. "Some of the great battles between Bill Russell and Wilt Chamberlain are some of the great one-on-one matchups ever in the history of the NBA, and they were classics. Absolute classics. "Probably no player has impacted the game more in the history of the game than Wilt Chamberlain." "The first time I met Wilt, we played in a high school game in Brooklyn and he came to watch me play. That was the first time I saw him, and everybody was talking about this guy, Wilt Chamberlain, from Philly. I finally saw him and I couldn't believe how tall the guy was. His nickname was "Wilt the Stilt," and his legs were like the size of my body. When I first met him, I was in high school and I was like 6-2 or 6-3, and he was the biggest man I'd ever seen in my life. I couldn't believe how big he was. That was my first experience. "My first time playing against him was in the Rucker Tournament. We used to play during the summer time all the time. I've told this story before, about the team from Brooklyn playing the team from New York. I was with the team from Brooklyn and Wilt used to play with the team from New York. "We had a guy by the name of Jackie Jackson who used to play on our basketball team and he was one of those guys who could jump real high. Well, Wilt used to always have this favorite shot where he would jump and shoot high off the backboard and it would go in. So, we figured out a play in the school yard. We said we were going to overplay him and let him shoot that fade-away jump shot, Jackie would come from the other side of the court and back then you could trap it on the backboard. So we decided we were going to do that. "It came down, they passed it into Wilt, I overplayed Wilt, he turned around to shoot it, Jackie came from the other side and he went up and blocked it. It was like two or three feet above the top of the basket and he blocked it and everybody just went crazy. Everybody was yelling and screaming and we were running around. Back then we didn't give high fives, so I guess we were doing low fives. Everybody was slapping hands. And this was in the school yards, where the projects were, and people were just hollering and screaming and the place was packed. I turned around and looked and Wilt was just staring at us like this (Hawk glares). He called time out and everybody was still hollering and screaming, but I was focused on Wilt. He just kept staring. "After the time out was over with, Wilt came up with the next 30 shots and they were nothing but dunk shots. He dunked it every way you could go. In the school yards, they have the baskets with no nets on them. And one time, he dunked the ball so hard, the ball went through the basket, hit the ground and it went over the 15-foot fence. Somebody went to go get the ball and when they brought the ball back, the basket was still shaking. That's how strong this guy was. He was just a dominating guy. "It's really ironic. I think about it and I don't think people realize just how great he really was. You hear guys talking about Michael Jordan and all these folks, but they really refuse to accept the fact that when you look at the record books, he has some records that will never be broken. He played like 13 or 14 years and never fouled out of a basketball game. He scored 100 points in one game. One year, he played, I think it was 54 minutes a game. He didn't sit down the whole time. He played the whole year. One year, he had like 55 rebounds in a game. Each year, he did something that was phenomenal, and I don't think anybody can ever top that. "If you watch film of him when he was in high school, he used to get the ball off the rebound and dribble the full length of the court. So, he was able to do that when he was in high school, even back then. If you've read his book, he was like a decathlete, he was a high jumper, he played lacrosse, and I think when he was in L.A., he did a lot of volleyball playing. A lot of people don't know it, but he was probably a world class volleyball player. "I remember one game, I'm sorry Jerry is here, but I was scoring a lot of points and he told me to keep shooting. I said 'Jerry, I'm tired.' And he said, 'You can't be tired now. Keep shooting.' It's a lot of work. It really is a lot of work to score that many points."